Our range of products include power supply 0 to 1000 volt and 0 - 500 a, digital variac, regulated variable dc power supply, ac power supply, dc power supply and multi output power supply. 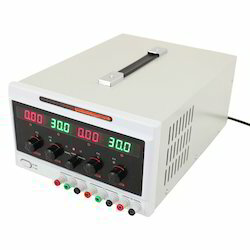 PLASTRONIX make DC Regulated Variable Power Supply Mainly used in laboratories and Industries. We are backed by highly dedicated team of professionals which enable us in offering an array of DC Regulated Variable Power Supply. The offered range is made available in several standard specification and can also be customized exactly asper the requirement of the clients.Our offered DC Regulated Variable Power Supply is mainly known for its fine finishing and effective performance. Features: With over Circuit Protection, Over Voltage Protection and Over Current Protection. Price may vary according to the buyers requirements. 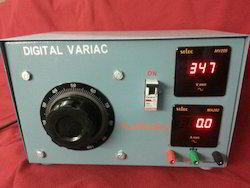 Plastronix make Digital Variac used for testing purpose.We are backed by highly dedicated team of professionals which enable us in offering an array of Digital Variac. The offered range is made available in several standard specification and can also be customized exactly asper the requirement of the clients.Our offered Digital Variac is mainly known for its fine finishing and effective performance. Price may vary according to the requirement of the customer. Banking on the skills of our diligent team of professionals, we are involved in offering supreme quality range of Regulated Power Supply. The offered range is manufactured by using premium quality raw material and sophisticated techniques in conformance with various norms. Our client’s can avail this range at very reasonable rate. * Note:Prices may vary according to the Buyer's Requirements. Leveraging by the vast experience and knowledge of this domain, we manufacture and supply the premium quality of AC Power Supply. Designed by using latest technology, the rendered AC power supply is easy to use and maintain. To meet the precise needs of our patrons, we render AC power supply in various technical specifications. Our company has achieved laurels in providing DC Power Supply to the clients. This product is precisely made by seasoned professionals utilizing high grade raw material with the help of latest technology. DC Power Supply is widely acclaimed for attributes such as resistance against abrasion, perfect design, long service life and easy maintenance. Leveraging on the vast experience and expertise in this domain, we are indulged in offering an optimum quality range of Multi Output Power Supply. The offered range is well tested on various well defined parameters in order to deliver a defect free range to our clients. 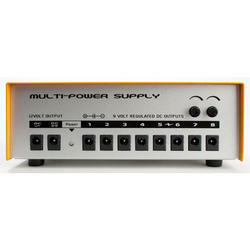 We offer this Multi Output Power Supply at market leading rate. We are passionately occupied in providing an exclusive array of Triple Output Power Supply for our respected clients. Exceedingly used in electronic, engineering, process and other industries, these SMPS are designed by our vendors using the premium grade components at par with the market prevalent norms. Provided SMPS are made available in numerous specifications that can be customized too. 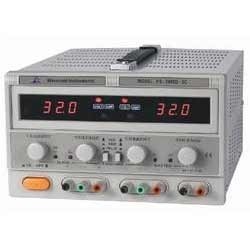 Being a reckoned name in this domain, we are involved in offering a superior quality range of Digital Power Supply. The offered range is made available in diverse specifications in order to suit client’s varied needs and demands. Furthermore, we also customize our offered range exactly as per the requirements of the clients.